The controversial, long-awaited prequels to the best-selling graphic novel of all-time are finally here: BEFORE WATCHMEN! For over twenty years, the back stories of the now iconic characters from Alan Moore and Dave Gibbon’s landmark graphic novel have remained a mystery, until now. 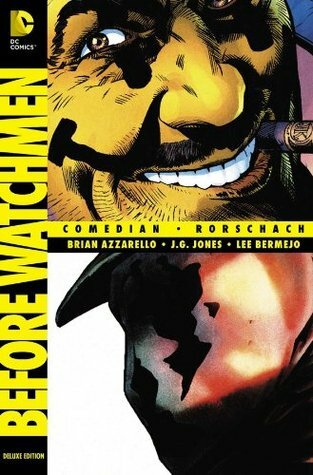 DC Comics has assembled the greatest creators in the industry to further paint the world of WATCHMEN, with this second volume starring two of the most polarizing anti-heroes ever, COMEDIAN and RORSCHACH. Eisner Award-winning writer and creator of 100 Bullets Brian Azzarello brings his gritty, nuanced storytelling to these two recognizable characters. In RORSCHACH, Azzarello again teams with superstar artist Lee Bermejo (JOKER, LUTHOR, BATMAN/DEATHBLOW) to illustrate how one of most dangerous vigilantes the comic world has ever seen became even darker. COMEDIAN, featuring art by J.G. Jones (FINAL CRISIS, Wanted), plants the famed war hero within the context of American history, as we find out how the Vietnam War and the Kennedy assassination revolve around him. The Comedian is by far the character I hate the most from the Watchmen series so reading his story was not enjoyable whatsoever. However, even if I did like him as a character, I would have been disappointed by this prequel because it didn’t span as far back as I would have liked it to in the Comedian’s life. Sure, there were interesting parts from when he was in Vietnam and a bit afterwards but I don’t think it connected to the original Watchmen comic very well. Rorschach on the other hand is my favorite character from the series so I really enjoyed his prequel story. Again, I wish it had spanned backwards into his life a little more, but honestly reading anything about Rorschach is enjoyable. The illustrations this time around were more dark and gritty which suits both characters really well. I’m glad I saved this one for last so I could finish this prequel series on a high note. For the whole series overall, I would recommend checking these out if you’ve read the Watchmen graphic novel, or even just seen the movie!